Many thanks for transporting the computers. Chembe have them installed and are in full use in the community project office and Stekas are working well too. Unfortunately Yamikani House was robbed and CID are still working (hopelessly I guess) to retrieve the stolen items including the computers which is really sad, desperate times in Malawi at the moment with food shortages and price hikes. Luckily no children were harmed when the robbery took place. "On behalf of STEKA I would like to extend our appreciation toward the support you have been sending to us for the Walfare of the children. The support of 9 mattresses,boxes of tools for the carpentry and boxers of beddings to the children are of useful and came at a time when we we in need of them. Children themselves were so happy to get them and say thank you very much and said you have to extend they appreciation. to all those who made and contribute towards those things. When would be suitable to drop the book boxes off? They will be a fantastic resource for STEKA! On behalf of the learners,sisters teachers as well as on my own behalf, I would like to thank Mr. Ramsay McGhee and his brothern in Ross and Cromarty,Scotland through you Gordon for the wonderful gift of 5 first aid boxes which were addressed to my name. These boxes came to our school through the Brothers who are the proprietors of this school last week. Indeed its a great relief to us as a school because we will be able to dress up the wounds of the learners right here instead of going to the hospital now and again. In addition to this, these plasters and bandages will assist learners who are doing carpentry if they have minor cuts. Best regards from Mountain View. Modester, Head Teacher at Mountain View School for Deaf Children, Bvumbwe. I had a call from a gentleman in Lilongwe this morning telling me that your consignment was going to be delivered sometime today. But seeing as thingsin Malawi don't always follow exact time frames, (if Any time frame !) I could hardly believe it when this enormous truck arrived a few minutes later. 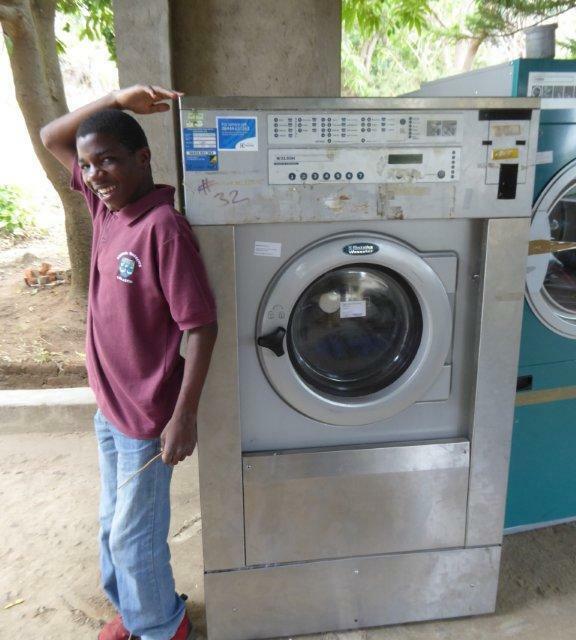 As you'll see in the photo, young Aubrey could hardly believe it either when he discovered that the washing machines inside the truck were asbig as he is! Laundry lady Esther thanked me about six times and I was really trying to tell her that it was nothing to do with me, but that just goes to show you how very pleased and appreciative our Home staff, (and office staff) are. The clouds are forming and we are looking forward to therainy season starting so the arrival of the machines couldn't be better in terms of timing. Helen and all at Open Arms in Malawi. This is a belated but very heart felt thank you to all of the people involved in the recent trip to Malawi with computer upgrades for 500 miles. 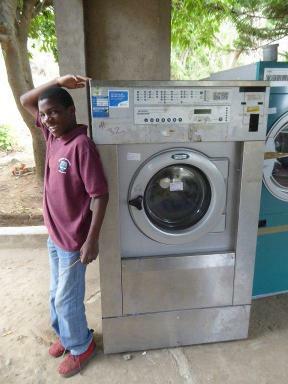 We received such great support in setting them up and are delighted with the new equipment. We really appreciate all the time, money and effort that was put into providing it all. The guys did an amazing job under some intense time pressures and they still made sure we were perfectly satisfied. Please pass on our gratitude to all who were involved. We are so grateful for what you are doing for us. Thank you for your great kindness. Thank you for the attached packing list including our 40 boxes of old Rossall School uniform. We will excitedly await its safe arrival to the children of Kammwamba Primary School. I will also very much appreciate it as well if you are willing to establish a communication link between me and the lady of the Education Department in Glasgow, whom you've mentioned to us regarding the groups of students they're taking out to Malawi. As you know, as a School we are exploring to do the same maybe. Any guidance on this or even collaboration may proof to be very beneficial for all involved. It will be especially good if it means we can also go and be of service and a blessing to the children and community at Kammwamba Primary School in the future. You've also mentioned some collaboration between you and UNESCO in Malawi, which I would love to hear more about, if you don't mind. We are part of a network of schools called the Round Square Schools www.roundsquare.org and are seeking to develop our profile under the guidance of Graham Wallace who is our RS Coordinator, amongst other roles he fulfils here at School. We greatly appreciate also the wonderful charity work you are doing in Malawi. May God bless you and what you do for the people there. My wife wrote you an email - thanking you for the computers that you donated to her school. I would also like to profoundly thank you for honoring my request. I and my wife were very impressed with your quick response. Even, the entire school management is very thankful. Imagine, she has now managed to install the electricity in that room we were i.e. office for her, the deputy and the Accounting personnel/Bursar. Here we had a disaster. The entire Lilongwe Central Market, which the LCC manages (I hope you have been there) got burnt down on the early hours on Friday 23rd September 2016 (around 2 or 3 am). Everything.....and I mean everything got burnt down. The market is currently being re-constructed. We are also trying to establish the cause of the fire. Greetings to the entire Team you came along with. Looking forward to your next visit. Once again....Thanks so much for the donation....both at the LCC and at the Chisamba School at Kawale II. Sad that we missed each other when you came to the IPCC on that date. It was just unfortunate and infact it was by a whisker. Above all my writing you is to express our sincere thanks and appreciation for the kind gesture you have always shown to the IPCC. It pleases us that you labour so much to support our project. A very big vote of thanks. I have delayed to communicate to you because I missed your email until I asked Sammy to send me. This does not mean that I am not appreciative. Sorry for this Brian. In my mail to Sammy I did mention that resources allowing, you may consider sending us next year some under-five food supplements. Malawi is going through a heavy crisis of food shortage. A lot of the children in the Paediatrics are malnutritioned. The whole point is hopefully to try and save some lives of these babies. This could be food for thought Brian. I am also looking at the computers that you sent us in the last two or three years also. Again resources allowing, you may help us with others. We have about twelve in total. As usual you will get the ones we are using now once replaced. Thanks for now Brian. Have a blessed day and continue supporting our Project at the IPCC. Greetings from the Warm Heart of Africa, Malawi, and in particular, the Interdenominational Pastoral Care Centre (IPCC), Lilongwe. I am aware that you came and we missed each other. I could have mailed you already, but I have been out of town for some other activities. Let me at this point in time express my deepest thanks and appreciation for your continued support, care and love for the IPCC. Therefore, on behalf of the office and on my own behalf, I wish to further extend the appreciation to all your team too: Sammy, Mark, Brian. You are indeed true supportive friends in all seasons. May the good Lord bless all your undertakings, both in Malawi and other parts where you have similar projects and activities. As usual I am working together with the hospital Nurses to identify the needy patients and then help them accordingly. As soon as all is complete, you will, as happened last year, get a copy of the report. This is very important for transparency and accountability. You might be aware, or have seen it while in Malawi, the hunger situation. This time people are already eating maize husks and some other tubers. My request in this regard is if possible next year, you may, if provisions would be available, help us source for some Food supplements for the under fives. Once more thank you very much. We are keeping fit. Currently we are running a training session for the faith leaders in pastoral visitations. We Dedza district council would like to convey an appreciation for a job your council is doing to our council. On 12th September we received equipment and on 13th Sammy and Mark came to our district to work with us, it has been a good gesture having them, they are very hard working and helpful to us. all the places where they work are thankful for the good work and for the help rendered they are looking forward to continue working with you. receive a word of thanks from the District Commissioner. I hope you had a nice journey back to Scotland. I would like to thank you so much on behalf of South West Education Division for working so hard to make sure that all the identified sites had computers installed. It was a very good combination this year; yourself and Maria Quintas worked hard in Malawi to accomplish the assigned work. The computer donation to our office and all government institutions will help improve record keeping in the offices and students will easily practice basic skills for them to pass well in computer studies. Please pass my thank you message to Gillian Walsh, Brian Kelly and of course the man behind the success of the Lord Provost fulfillment computer donation to Malawi Mr Robert McPhee. I hope you are doing fine and that you had a safe trip from Malawi to Glasgow. I would like to say thank you for the medication which you brought it is a thing I did not expect you could do for me after I told you that I was unwell for a week. I am now feeling better and the medication is helping me alot. My appreciation to Gillian as well for giving a hand and making sure the project was a success this year. You managed to handle the shipment issue well and indeed the goal was achived as planned. I have always appreciated your visits to Malawi since I started working for the Council in 2005 and you have given all our projects a tremendous support.You are hard working people,kind hearted and I hope the 2017 visit would be a success again. Just as a reminder on the laptops which you might intend to give the Council I was told they need to be loaded with Window 7 operating system. To appreciate if in the next shipment this can be sent for our use. Thanks again for all your IT equipment this year it means alot to our Council development. Warm greetings from Malawi. We are very very grateful for the donation of 20 desktop computers, a laptop and a printer for the College Computer Lab. This will go a long way in assisting our student nurses and lecturers in the teaching and learning process. Many thanks to Brian, Gillian and Robert and everyone in the Project for this wonderful gesture. Yes, we will try our best taking care of them especially keeping them free from viruses. The tutorials by Bernard are very good and came when we needed them the most. On behalf of the entire College workforce and student community let me convey to you Maria and Bernard our sincere gratitude for equipping us with such materials. Thumbs up for the entire project. From: Management, Staff and all Students of Chisamba Community Day Secondary School. It is our sincere hope that you had a safe journey back home in Scotland-Glasgow. Our school would like to express its sincere gratitude for the assistance rendered to it. The computers are going to contribute much to the success of the education of our students. It is a very remarkable experience because since the time the school opened in 1992, it has never had a computer of its own. Members of staff are really grateful for the assistance. Once again thank yo so much. As a school we would like to thank you so much for your support. The computers will help the students to acquire skills that will help them especially in this age. So once again thank you very much. Wish you all the best as you go back home. Robert has informed me that they have installed 20 computers in the new computer room at Zomba Campus and will install 10 computers at Blantyre Campus tomorrow. They have also given one laptop computer to Zomba Campus. Sam came to Lilongwe Campus last week and our ICT Officer told me that they replaced 9 computers in the library that were not functioning. Thank you for this great assistance that will go a long way to the training of health care workers at the college. I would like to acknowledge that YAEHTC has received the four Windows 7 Computers in exchange for the old computers as agreed and a faulty monitor was also replaced with a good one. Our organization has entered a new premise in Falls Estate where the Free Computer Lessons and HIV/AIDS Education are taking place. This new premise is still under construction, the room has just been fixed with a door, security door with three heavy duty locks, but the place is yet to be surrounded with a brick wall fence, which should be constructed within the next one and half months. Meanwhile, the computers are kept in the main house overnight for maximum security until the following morning. Once the brick wall fence is constructed, the computers should be very safe in the computer room since the brick wall fence will also have a lockable gate. There are two computer rooms on the site, your IT Team visited the larger room which is completed, and another smaller room will be finished in a month's time. The only works remaining is painting outside, labelling, and fixing of computer stands which will be eight in the larger room and six in the smaller room. Currently, we have registered twenty five youths and ten children who will be trained within the next three months and the youths and children will be using the larger room and smaller room respectively. Shortly, I will be submitting an overview report on these training programmes. Once again, let me convey our sincere gratitude to Glasgow City Council for your continued support. I hope you are in Dedza now and that you had a safe trip. We have always appreciated your visits each year as you take care of us personally and the Council. Please extend my thanks to the Lord Provost,Gillian and Brian for a wonderful I T project this year and all the I T equipment sent to the Council and the schools as they mean a lot to the development of the Council and our I T section as well. Despite the delays of the shipment you managed to work tirelessly to finish all the projects in Lilongwe on time. We hope next year all will be fine. It was amazing to partner with you. We as Mamas Schools are pleased to be part of the school that have this day of 12th September, 2016 to be beneficiaries of your organisation. We are pleased to announce that we have received two desktop computers through the Lilongwe City Council courtesy of your organisation. Hi All, just back from very successful trip to Tigray. Screened 1300 kids aged 10 to 13 yrs in 7 Mekelle schools, using the PEEK system, (Portable Eye Examination Kit) based on a smart phone, to see the % of kids who had refractive issues potentially affecting their progress of education. (See Pics) 8% failed the screening with 4% needing help. Also, many teachers were checked and RRs supplied where needed. This has been hugely welcomed by the Education and Health Boards in the area and Sight Aid International is now regarded as a major contributor to eyecare in Tigray. If PEEK proves successful, all schools in Mekelle ( over 90 of them) will be screened, then it will spread to whole of Tigray (12 large towns), followed by the whole of Ethiopia. PEEK is now being used 'nationally' for Kenya; Malawi; Rwanda; parts of South Africa and is being considered for whole of India, huge challenge !!! The success of PEEK opens up doorways to large amounts of funding to help developing countries. A chain of glazing workshops in Tigray would have to be established to cater for the production of specs and a team of trained healthworkers plus team Optoms would be involved in the screening and eye testing. Special thanks to Brian for donation of laptop from Glasgow Council to a student who has been a loyal employee at Quiha Eye Hosp workshop for past 5 yrs. He was over the moon with this gift and he truly deserves to continue his Masters studies (Electrical engineering and Accountancy) as he is the main family bread winner for mother and 2 sisters who live in very poor conditions. It was indeed a great pleasure to have met you yesterday. We are so grateful for what you are doing for us. Thank you for your great kindness. Travelled to Malawi a couple of months ago , and I am pleased to say the stack and scopes that you helped transfer to Kamuzu hospital are fully working and fully utilised by the team . My wife and I have been supporting an orphanage in Kamwamba , Ntcheu District for a few yrs. We also visited the local school in the village and met the headmaster who has developed links with a local school here ( Rossall school). They have changed their uniforms and have a surplus which they would like to donate to the school in Kamwamba . The laptop will be mainly used by a young Ethiopian called Asmelash Hadush at Quiha Eye Hospital in Northern Tigray. I set up the Optical workshop and Vision Centre at Quiha 6 yrs ago whilst I was volunteering with Vision Aid Overseas, see attached pic. Asmelash was one of two young students who had been selected by the hospital to train as Optical glazing technicians whilst still studying at night school to improve their education. He has been incredibly loyal to the workshop, despite only earning around £96 per month. He comes from a very poor background, see other pic, and lost his father in a mining accident over 10 yrs ago and so became the main bread winner to support his mother and 2 younger sisters. His 7yr night school studies have now gained him a Degree through the local University, but he now wants to go further to gain a Masters, which will increase his job opportunities so that he can continue to support his family. Because he lives a short walk from the Hospital, he states he will continue to work at the glazing workshop on a part time basis and at weekends to gain some extra income even after acquiring a better position. He will use the laptop for stock control at the workshop as well as some personal use to help with his continued studies. In the event of Asmelash eventually leaving his job at the workshop, we can state that the laptop is retained at the Hospital for glazing workshop use. Thyolo Youth Centre has been launched and they did made some renovations though the space is still too small to fit all the computers because currently the 25 computers are fitted in and when the 25 students are in class the room is still warm. Don't have Thyolo pictures yet, l will send them to you as soon as l get them. Attached are the pictures for Bangwe Youth centre current ICT Class for the Action for Adolescent and Youth (A4AY) in session . Staff from our Biomedical Sciences Programme have checked the laboratory equiptment and it will all be of great use to the teaching of our students. This assistance is greatly appreciated.